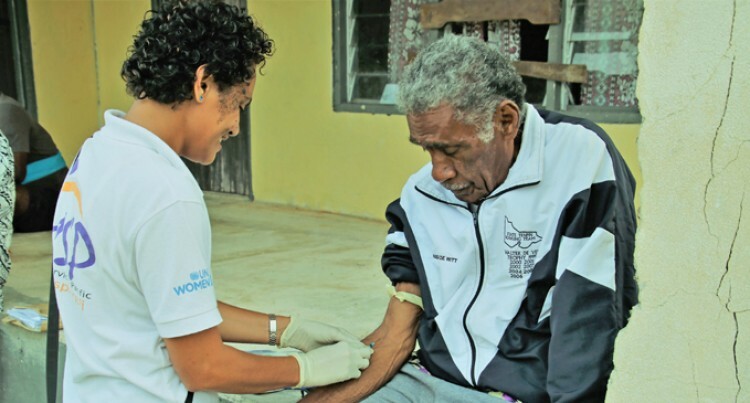 A Yasawa Nurse conducts health screening in Yaqeta Village in Yasawa. It might be a small token of appre­ciation or maybe a thank you that’s been motivating a 16-member Gov­ernment delegation who are in the Ya­sawa Group. They are providing mobile awareness and service delivery on social, eco­nomic and legal rights enshrined in the constitution. For many of them, it is their first time on the islands. They find it rewarding and comforting to serve the people who are challenged physically and geo­graphically. The Rights, Empowerment and Cohe­sion (REACH) project under the Min­istry of Women, Children and Poverty Alleviation works with other Govern­ment agencies to reach out to commu­nities in the rural, urban and mari­time islands to provide a one-stop shop for all Fijians. Villages in the district of Naviti, Nacula and Yasawa have echoed their blessings and appreciation when the officials assist them with in-depth le­gal advice, rights and responsibilities, birth and death registrations, civil marriages, social welfare and women services, health screening with cervi­cal and prostate cancer tests and busi­ness registrations. Selavasio Barua of Somosomo Vil­lage in Naviti district said the aware­ness on Legal Aid broadened their knowledge about the consequences of breaking the law. “Today’s session has provided me another opportunity to learn more on the things that are usually taken for granted in the village. Sometimes we take our spouses for granted,” he said. Mr Barua said the villagers also thank the awareness done by the Medi­cal Service Pacific that spoke about cancer prevention and early detection. They intend to revisit the Yasawa’s for monitoring, social protection re­views or even another service delivery. The REACH team is currently in the district of Naviti.